The client is a boutique advisory firm that offers individuals and enterprises specialized strategies & solutions to address specific problems or aspects of the business. Helping their customers through expansions and new ventures, the client has created a name for itself as a leading and innovative solutions provider in the Middle East, Asia, and Africa. Based out of Dubai, United Arab Emirates (UAE), the client provides niche fraud and compliance related services to logistics, F&B, hospitality, and supply chain industries. As a customized service provider, the client creates tailor-made suites to meet their customer requirements and serves many prominent enterprises and family businesses. As a crucial part of their ongoing project, the client was looking for a financial modeling services provider to help them analyze financial statements of twenty firms and create high-quality financial models. The client provided key metrics on which the collected data needed to be sorted for better data clarity and visibility. The challenge in this project involved validating financial information to create an accurate financial model. The report required to have information from ten quarters bifurcated into comprehensive segment-wise data. Outsource2india is a pioneer in providing financial modeling services to a list of global clients which include some top names from the Fortune 1000 companies. The team of financial modelers at Outsource2india have a knack for understanding client requirements and providing exactly what the client is looking for. Our team created financial models after considering the previous ten quarters data as requested by the client and carefully worked on metrics as required. The financial model we provided included well-documented assumptions that flew logically and explained the functionality properly. The spreadsheet also included clear inputs and outputs with easier navigation and desired content. With the completion of this project, our client expressed immense satisfaction with financial models and reports produced by our expert modelers. We furnished models that were derived from verified financial datasets in a secure way. Our presentation also represented well-defined inputs and outputs captured in a brief time on a spreadsheet. 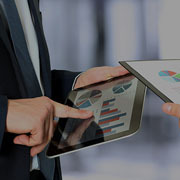 Outsource2india is a go-to partner for financial research services. We have catered to a list of global clients including some top Fortune 1000 companies for close to two decades. Ours is an ISO-certified organization which offers customized modeling services that meets all client requirements while saving valuable time and money. If you need a partner with secure infrastructure, professional team, and cost-effective services we are the right people for your project. Contact us today to avail superior quality financial modeling services from a global talent pool and see your business transform.